I'm so excited about what I'm sharing with you today. But be warned... this will be a long one and I can't make it shorter because I have things I have to say about this topic. Hang with me!! Last spring, I got the unexpected opportunity to go to work for an amazing woman that I've admired for the last decade. She is a professional organizer. We bumped into one another in a store, she asked me for some help on a job and it was just my favorite thing ever, so she hired me!!! That's God fingerprints right there. Anyway, we do things like organize people's pantries, garages, offices, closets etc, and we label and contain things in bins and we help them downsize what they don't need, and maximize the space they have for the items they keep. We also redecorate, hang pictures, make every space prettier than when we got there and mainly, make it work best for their needs. It's the loveliest job ever, and I adore it with all my heart. The bonus is the ladies on my team who I enjoy and admire so much. We love one another like family. I still pinch myself that I get to do this. (Apparently I'm out of sugar.) These cute jars work for me but they don't for most with all the fuss of decanting and space hogging. I keep the sugar and flour in those large sized canisters because I frequently put them onto the counter as decor. I may be switching to more streamlined functional containers in the future but these are it for now. Junk drawer. Gotta have one! This could be better but to be honest it works perfectly for me right now. I just moved these last week and moved the glass doors here. (more on that at the bottom of this post) Love having all my options visible. Accordion stand up rack from Ikea was the the only thing that fit this narrow cupboard. This cupboard used to house my glasses, being right beside the sink... however when I did the flip flop of these two cupboards, I didn't realize how much I would love it... half of the cupboard is hidden so things like my seldom used tea set is back there. And the best part- it's all right above my espresso machine! I love you an awful lot to share this one... it's where everything with no home goes to live, and very much a work in progress!! It's an awkward lazy susan type cubboard and I've hated it since I moved in. Wish it had those turning racks and I always think I'll put some in someday. Again... real life. **I did not tweak any of my drawers or cupboards for you, this is real life...BUT thankfully the garbage wasn't overflowing the day I did these photos!! I live by one very simple question when it comes to organizing my own house. "Is this the best way to do this for my family?" That's it. If it is, I leave it be. If it's not, I change it. And I change it as many times as I need to, in order to make it work. If you have always had those bowls on that shelf but it's inconvenient or doesn't work for the flow of your kitchen.. move them. You aren't married to any of your decisions! My favorite way to organize my cupboards/drawers, is to make a plan for what dividers I need first. Then once I've made or purchased them, take everything out of the space I need to organize. Line it if if necessary. Toss or donate anything not needed. 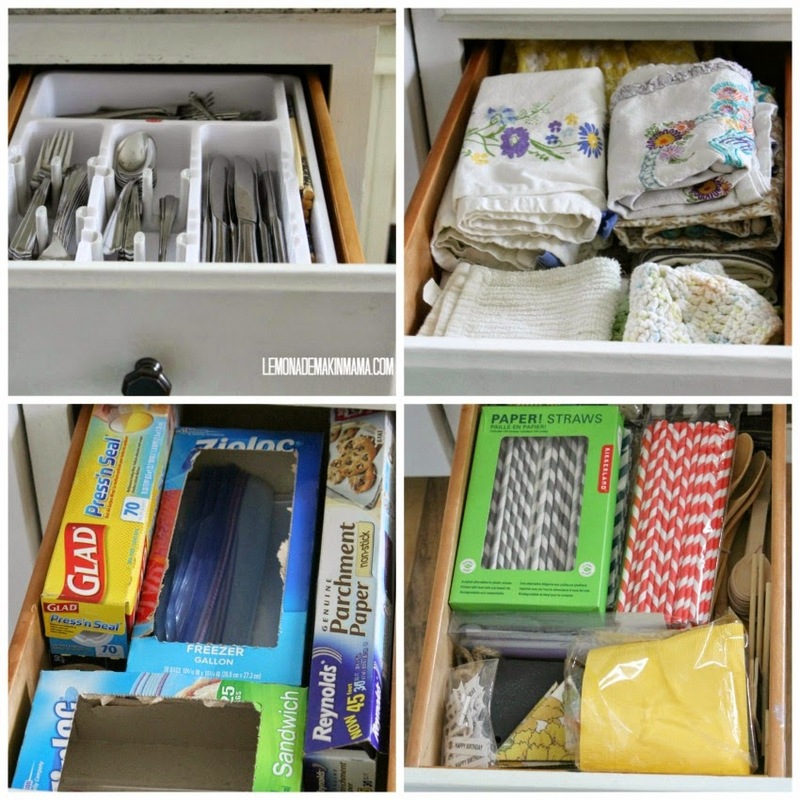 Place dividers, trays or containers into drawer or cupboard and then put everything back in an orderly way. Move to the next drawer or cupboard. I like to line as many drawers as possible with non stick matting that you can buy in a roll and cut to fit. It keeps things clean and in place. I also like to label things but I do live in the real world where my kids don't read or care what my labels say. That's real life. The principle is that there IS a system... whether or not it gets followed to the letter or not, it's there and easily fixed. My common sense rules of thumb - Keep things handy where they make sense to live. So, I like to keep dishes near the dishwasher, potholders and baking pans near the stove, baking ingredients together, coffee and tea items near the coffee pot and a junk drawer for those utility items you need to grab occasionally. I like to use above the fridge and microwave spaces for things I don't access often and I like to keep all of my dishes in the kitchen (even special occasion types) so that I can use anything at any time, rather than saving things for "special occasions," which means they are seldom used. Out of sight, out of mind. I keep utensils handy in a container beside the oven, I alphabetize my spices for quick grabbing and I stack pans vertically to save on space. 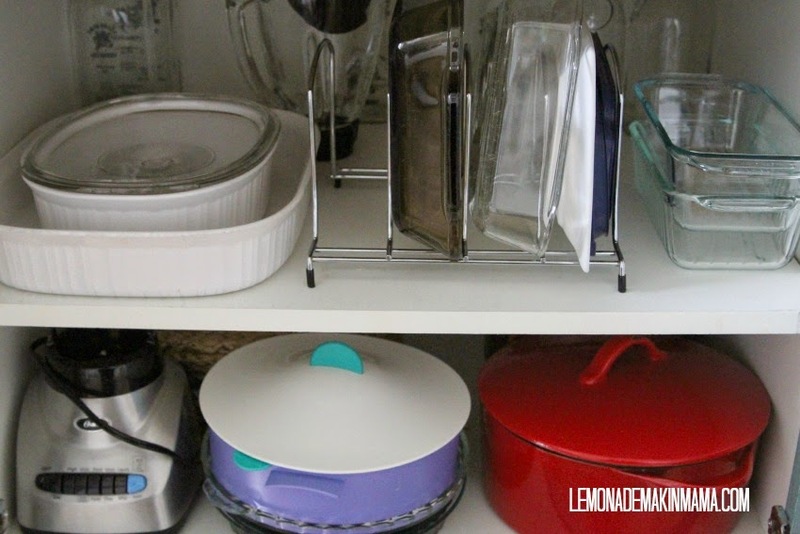 I like to keep my lids with the pots they go with and I hide my toaster on a tray, in a cupboard along wtih other small appliances I don't use often, because I like my kitchen to feel clutter free. The way our home is designed, the kitchen truly is the center and heart of our open concept home and this is a necessary thing or we all begin to feel closed in. I don't keep anything extra and certainly nothing out of obligation (sentiment is different) and I only hang on to what I use and need because if I am not using it, someone else might be blessed by it if I donate it. These are my guidelines. Take what you want from them and make your own set of guidelines that work for your house! The thing was... I LOVED those glass doors and wanted to see them someplace. This cabinet was the only one that made sense so I moved them here and swapped the glassware with the coffee/tea items and LOVED that even more! It's so light and airy and I'm thrilled with the change. And if you're still reading... good job! Whew that was a long one! Go fourth and be inspired to tackle those kitchen projects and organization. It's the heart of our homes and where everyone typically gathers so it's worth it! I love your kitchen, its so clean and organized! I especially love that you have your spices in a drawer, I am absolutely stealing that idea. Your kitchen always looks fabulous and now we know the inside scoop. :) I have a question about the liner in your drawers and cabinets...is that Rubbermaid? When we moved in our house three years ago we used a generic of that cabinet liner and I don't like it. It scoots all over the place and serves no purpose other than to bug me. Do you have that problem? I am in love with that Peacock Plume cabinet - and the changes you made by swapping the glass doors. I agree so much with a lot of what you said. I don't want things out on my counters if I don't use them every day. My coffee pot (the regular) is in a shelf on my pantry. I use it every day, and my coffee is right by it. My toaster/blender/waffle iron sit in a drawer. I have always been a person who feels that as long as it's out of sight I don't care if it's organized - but I am rapidly changing the older I get! The clutter - hidden or not - has had to go! okay, you make me want to go clean my entire cabinet area! Hahaha…Looks great. I love you pieces also! AND - what a fun job for you!!! Organizing really ices my cupcake! What a dream job! Some great ideas that I might just be borrowing soon. Thanks for the tour! Everything looks beautiful! So airy and clean and ready-to-use. I especially love how you painted the back of the cupboard. The house we live in now is the first one I haven't taken cupboard doors off in the kitchen. But you may have inspired me! I just love the open shelf look and have so many dishes I'd like to show off. Thanks for always being inspiring! Girl you are so blessed to have a job that you LOVE so much and get to work with some awesome people. :-) I am so glad for you and your family. Oh yeah I also love ALL your organizing! I am nesting right now myself and just love to Craigslist things that I am not using knowing that someone else will. Love it all hun! ~hugs~ Oh PS....I did get the see the numbered little drawer that I sent you. :-) LOL Have a great day. I have been waiting for you to write this post. You truly have a gift for organizing. Your house is always so tidy. I have always wondered how you keep it that way. Goodness, even your junk drawer is tidy. LOL, I can't say the same for mine. You have inspired me to do some cleaning out and making this more functional in my home. Thanks for sharing what you do. Looks so organized and beautiful! Love your colors Sasha!